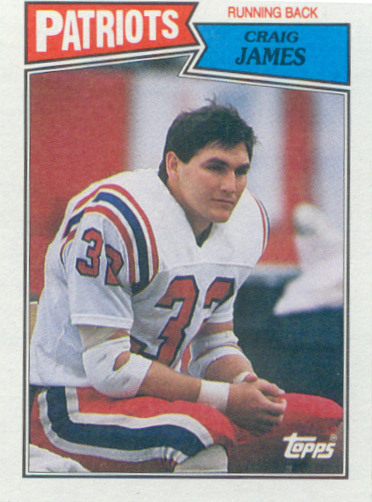 Craig James is feeling his oats. The former football player turned “analyst” for ESPN college football has decided to abuse whatever power his national megaphone gives him. He precipitated the firing of Texas Tech coach Mike Leach and, according to Leach, his “meddling” was largely responsible for the action the College took in firing him. Rece Davis interviewed Leach after his firing. Leach describes James as constantly meddling, calling the coaches so often that they had to institute a policy of ignoring his calls, and raising a spoiled son who felt entitled to playing time he hadn’t earned. I am sure Leach shares some responsibility for his firing, but anyone who has spent much time around coaching recognizes the deadly combination of an athlete with a poor attitude and a meddling parent with clout. The power of influential boosters in those football programs where the sport is “big business” is hardly new. If fact, James played his college football in a program that is infamous for flaunting the rules, SMU. The corrupt SMU program is the only one in the history of college football to receive the NCAA’s “death penalty.” Crain James was one of the star running backs during those corrupt years. Explaining the problem of meddling and influence to James is like explaining water to a fish. Sports Illustrated writer Tim Layden listed the top ten embarrassing episodes in the history of college football and ranks the SMU scandal number two. The history and mythology of modern college football are papered with examples of programs whose keepers and boosters flaunted NCAA rules by building quasi-professional programs with marginal student-athletes. But only one has received the NCAA’s death penalty: Southern Methodist University. The Mustangs rose to the top of the high-powered Southwest Conference in the early ’80s, riding on the back of the Pony Express backfield (Eric Dickerson and Craig James), and twice finished in the top five in the nation. At swank parties all over Texas, where football is big business, SMU alums bragged to their Longhorn and Aggie brethren. Then the bubble burst: SMU was found to have made approximately $61,000 in payments to athletes from funds provided by a booster, with the approval of university officials as high up as former — and future — Texas governor Bill Clements, who was then chairman of SMU’s board of governors. NCAA officials did not levy the penalty lightly, but, said Dan Beebe, the lead investigator on the case, “I’m not sure what else would have gotten the message across to those people.” It has been nearly two decades since the NCAA took down SMU; 16 schools have since been eligible for the death penalty, but none have received it. Let’s be frank here. The BCS is a mess every year. But it was in 2003 that the system came crashing down in one big heap of absurdity. LSU, Oklahoma and USC each finished the season with one defeat. USC was ranked No. 1 in the media and coaches’ polls but would not be invited to play in the BCS national-title game because the BCS rankings listed the Trojans at No. 3, keeping season-long leader Oklahoma at No. 1 despite its 35-7 thrashing at the hands of Kansas State in the Big 12 Championship game. Ergo, LSU defeated Oklahoma in the Sugar Bowl, one day after USC pounded Michigan in the Rose Bowl. Here we are again with the “big boys” excluding teams like Boise State and TCU from receiving the credit they earned on the field. I am reluctantly willing to accept BSU ranking number two behind Alabama even though the so-called National Championship game was pretty much an exercise in ineptitude with both team proving that their success depended upon one player. Texas was impotent without quarterback Colt McCoy and Alabama was less than one dimensional when Heisman Trophy winner Mark Ingram was out with cramps during the third quarter. What does this have to do with Craig James? As Brian Murphy of the Idaho Statement points out, by his “outlier” vote of BSU ranked 7th in his final poll, James almost single handedly skewed the results, dropping the Broncos to 4th. James, who had voted Boise State No. 11 in his final regular-season rankings, moved the Broncos up to No. 7 in his final poll. The Broncos were behind Ohio State, Penn State and Iowa on his ballot. No voter put Ohio State, Penn State or Iowa higher on their ballots than James did. Boise State received 19 points from James’ ballot. Had James voted the Broncos No. 4, they would have earned three more points and closed the gap with Florida to a single point. It’s not just Boise State. James also voted TCU No. 14, the lowest among all voters. 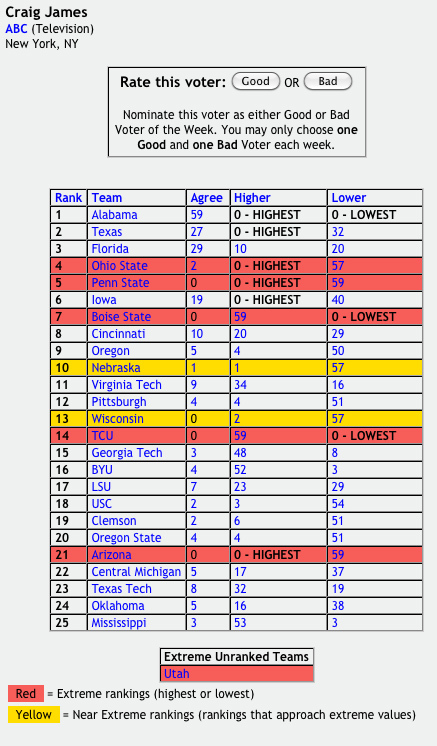 Of the 60 ballots, Boise State was No. 2 on 22 of them. The Broncos were No. 3 on six. The Broncos were No. 4 on 30. They received a fifth-place vote (Kirk Bohls, Austin American Statesman) and a seventh-place vote (James). Bohls voted Ohio State No. 4 and Boise State No. 5. The difference between Florida and Boise State is that Florida did not have any low voters. All 60 placed the Gators No. 2, No. 3 or No. 4. Had James and Bohls vote the Broncos No. 4, then Boise State ties for No. 3 in the country. Thanks to “pollspeak” we can see the voting record of the AP voters. Note that you can choose a “good” and “bad” voter. Not that it really makes any difference, but I did get a small amount of pleasure making James my “bad” voter. You can make your choices here. Any guesses as to the next career move for Craig James? Think about it- a right wing Republican from Texas with a degree in “Liberal Arts” from SMU. Isn’t it obvious? ESPN football analyst Craig James has had a raised profile for the past few weeks with his son being in the middle of the events that led to Mike Leach being fired at Texas Tech. But he may raise his profile even higher. The former SMU running back may run for the seat that Republican Kay Bailey Hutchison is resigning. He is a Texan concerned about his country who disagrees with “the approach we are having”. Does his way with words remind you of anyone? Finally Coach is back on the sidelines. Now we have to deal with Kent Hance and about 3 regents. ARRRRRR! Great job, Mark.